Deborah this is fascinating. Thank you! I love this whole post. The pianists, you and her, and your description of the emotions of making music. Thank you, Claudia. That means a lot. I’m excited to introduce her to others who, like me, may not be familiar with her playing. Debbie this is exquisitely beautiful. Thank you for sharing. I think it is great that you are re-learning to play the piano. That’s quite a challenge and I admire you for that, as well as all your other accomplishments. Thank you so much, Ginny! It is a challenge,but I’m so glad I decided to do this. So now you have introduced me to a new fav musician…since piano isn’t my ‘primary’ instrument (even though I always had a connection to it via music theory, etc) I don’t really know names in that realm. I have always held pianists in high regard due to the complexity of LH/RH sight reading even thought the actual piano itself is very ‘user friendly’. I’m glad I’m not the only music lover to have never heard of her below now. 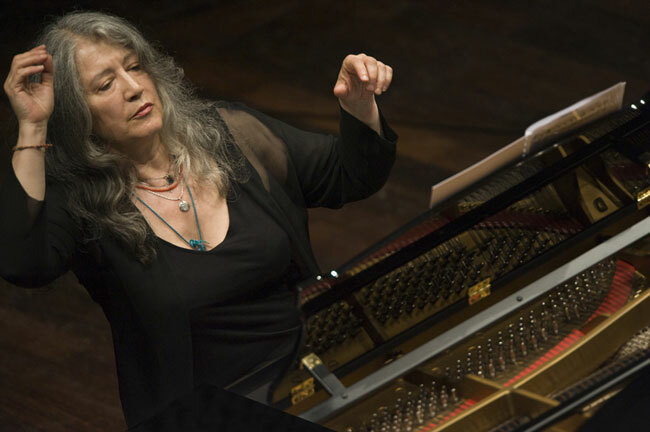 I really liked that quote on aging from Argerich too. Learning what we really want to do, no matter what age we are, is so important. That’s how it is with all instruments. Thanks for sharing. Gonna play my guitar tonight! Enjoy your music-making, Jeff, and thanks for sharing. I absolutely love Martha as well. I completely agree with your comment about playing piano and how difficult it can be to coordinate all the parts of the body at once – it’s why I think the piano is harder than most other instruments, that utilise two or three different body parts. I am so glad to hear that, Paul. It seems to me it must be the hardest, but since I have little to compare it with (I played the guitar and the recorder only briefly) I wasn’t sure. I did some research and learned that many think piano is the easiest instrument to learn to play initially, and the hardest to master. Either way, I love playing and have no illusions of ever “mastering,” but continually improving, that’s more goal. To be able to play a few well-loved pieces well, and keep adding to that repertoire. Thank you for coming here and sharing. Where does her charisma come from? I’m not sure, but it’s palpable. Four years ago I was barely starting to listen to some classical music when I stumbled on a video of her, and I was instantly conquered. I subsequently managed to see her perform live 16 times. I’ve heard most of her repertoire, except the Chopin concertos, and it’s been a powerful experience every time. I never left a concert hall after hearing her without feeling wistful, like I was leaving somebody dear and close to me. No wonder she elicits the reactions that a rockstar would. I wish I could see her perform live, just watching the videos of her playing is so inspiring. Thank you for sharing this with me. Knowing that her playing draws others in the same way it draws me is an additional sweetness. Wow. I’m a pianist myself and this really made me proud as a trained pianist. You should be proud. Thank you for coming here.